One of the less appealing constants of life in the southeast is the threat that weeds pose to lawns. As they relentlessly test their environment for chances to take root and spread, they can sometimes seem like their attacks are planned. They can travel by wind and water, or they may get mixed in with poor quality grass seed and soil adjustments. In the battle to prevent them from taking over your beautiful lawn, the first tool you need is knowledge. Just as weeds vary widely in shape, size, and color, they differ in the conditions they prefer and the methods that are most effective in combating them. Nutsedge (Nut grass): Distinguished by its three-sided stem and star-shaped flowers, nutsedge is tough enough to split reinforced concrete and asphalt driveways. 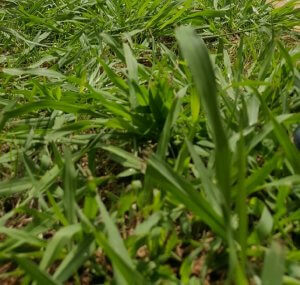 Most common in Bermuda lawns, nutsedge is generally active between April and September. Treatment: This weed is always a challenge for homeowners, especially those with large plots of land. Keeping a lawn cut as short as possible can deprive nutsedge of nutrients and eventually starve it to death. The most effective solution is a spot treatment of areas where this weed has started to grow. Doveweed: Doveweed is a summer annual that initially resembles a grass, so it is easy to overlook until its leaves and fleshy, creeping stems become apparent. Classified as one of the world’s worst weeds, it spreads aggressively and is extremely difficult to control. Treatment: The best solution available is a combination of pre-emergent and post-emergent herbicides. Virginia Buttonweed: This broadleaf perennial arrives with spring and grows throughout summer. Its deep roots and spreading branches thrive in moist to wet areas. Treatment: As one of the most difficult broadleaf weeds to control, it requires a specific treatment. It’s not unusual for heavy infestations to require multiple herbicide applications over two summers. Dallisgrass: Dallisgrass is another of the most problematic weeds in the southern United States. It loves warm, moist areas and thrives during the summer. Treatment: Hand-pulling Dallisgrass isn’t very effective. As we’ve already discussed in other cases, the best response is twofold. First, maintain healthy, dense turf through proper watering, mowing, and fertilization. Next, post-emergent herbicides are applied several times at two- to three-week intervals to prevent regrowth. Scheduling weed control depends on the type of weeds you are combating and the stage or stages of development they have reached. Treatments for the weeds we’ve listed are included in our regular service at no extra charge but they are tough to get rid of. For especially tough cases, we can provide an extra application between scheduled treatments. 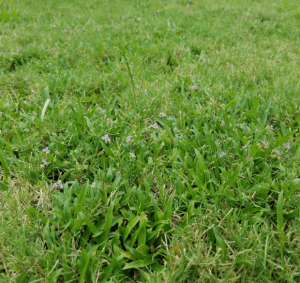 Our lawn specialists are trained to develop customized treatment plans that include spot treatment of existing weeds that can be treated without shrub injury.